Do You Live In An Android State Or An iPhone State? It is clear by now that Android is winning the overall mobile market share battle in the U.S. among smart phones. But how does the battle break down by state? Mobile ad network Jumptap put out a report this morning (embedded below) with a map showing which states have more Android activity versus iOS activity across its network that reaches 83 million mobile users. According to Jumptap, Southern and Western states like Florida, Texas, California, and Oregon over-index for Android. Whereas the Midwest and New England states are dominated by Apple devices. Strangely, New York state is neither. It is one of the few remaining Blackberry strongholds. (I’m sorry, that’s just embarrassing, and I live in New York). Overall Android market share is 38 percent versus 33 percent for Apple’s iOS, as of June. By comparison, comScore just released market share estimates on U.S. mobile subscribers yesterday that puts Android at 40 percent and Apple at 26.6 percent. The Android numbers are close, and the large difference in iOS share could be because Jumptap is counting iPod touches while comScore is not. 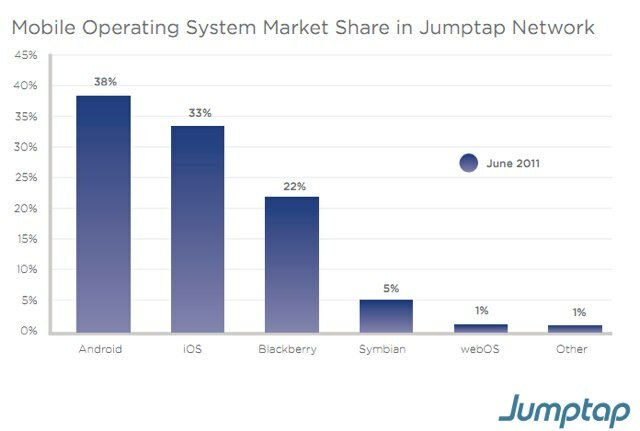 (Jumptap is concerned with ad impressions in mobile apps, comScore looks at smartphones only). What is clear is that there are more Android phones in the U.S. than iPhones. But more is not necessarily better. If you drill down to JumpTap’s click-through rates, iOS still performs better for adevrtisers. Mobile ads on iPhones, iPads, and iPod Touches are clicked on 0.78 percent of the time compared to 0.47 percent for Android (and 0.36 percent for Blackberry). Remember, this data is only based on the activity on Jumptap’s own network, which could be skewed one way or another, but it sounds about right. The sad thing is that a 0.78 percent click-through is the best the mobile ad industry can do right now. Forget Android versus Apple for a moment. What that data says is that mobile ads are failing across the board.